Never miss a minute of the big game with your snacks and drink right in reach. Flip down the built-in table to create a comfortable spot you won’t have to leave for hours. Keep your snack bowls on hand as you sit back to relax with friends and family with the simple use of the built-in flip top table. Be comfortable from head to toe and eliminate the awkward space between your feet and the seat of the chair that some recliners have with a fully padded chaise. Recliners without a fully padded chaise can be a hazard to small children, who may hurt their little hands and feet while trying to retrieve a small toy that dropped into the open area. The padding allows your entire body to be enveloped in the chair and creates a comfortable sit all over, while helping to improve child safety. Sit back and relax from the comfort of this motion sofa. 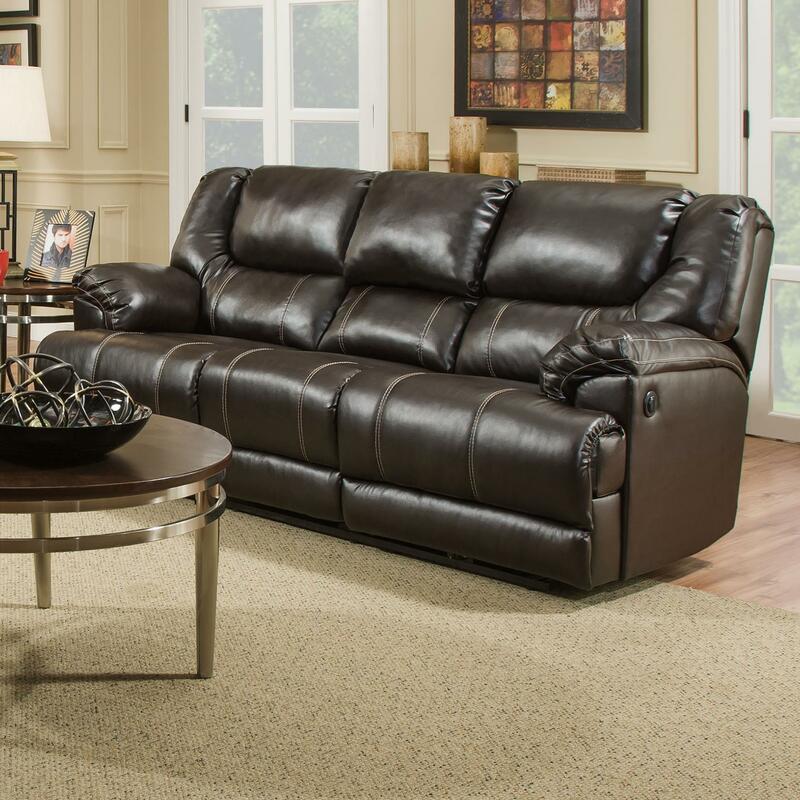 This reclining sofa features a drop down table for additional storage and function. The plush pillow arms on either side and padded seat backs will wrap you in comfort. The 50451 Casual Motion Sofa with Table by United Furniture Industries at Miskelly Furniture in the Jackson, Pearl, Madison, Ridgeland, Flowood Mississippi area. Product availability may vary. Contact us for the most current availability on this product. Seat Fully upholstered chaise seat with two reclining ends. Add comfort and style to your casual living room or family room with this motion collection. Choose a sofa with drop down table or love seat with console to give you comfortable seating and functioning storage. The 50451 collection is a great option if you are looking for Casual furniture in the Jackson, Pearl, Madison, Ridgeland, Flowood Mississippi area. Browse other items in the 50451 collection from Miskelly Furniture in the Jackson, Pearl, Madison, Ridgeland, Flowood Mississippi area.